I got a call early on a August Sunday morning in 1988 from a fellow named Dean Boraas who was a friend of mine and also the "New Rollers" tour manager. He knew me from other projects that we worked on together and asked if I would be interested in doing a short 2 month tour of the USA and Canada with the Rollers. I agreed and left the following day for Detroit, MI where the Rollers had arrived only a few days earlier. They were rehearsing for the up coming tour. I scurried to learn the songs and soon found myself as the only American in the band and rehearsing with a bunch of wonderful people. Eric Faulkner, Karen Prosser (Kass), Andy Boakes, John Richardson and myself making music. It was awesome! Over the next few months we did alot of gigs on the east coast of the USA and then into Canada. We played a to crowds of up to 3 - 4000 people and also did a few television shows. Everyone was really cool and easy to get along with. We had alot of fun even though Eric was working constantly on travel plans and writing new material. We played all of the oldies (Saturday Night, I only want to Be With You, Money Honey, Roch'n'Roll Love Letter, Shang-a-lang, Yesterdays Heroes, The Gig) plus alot of new material (99 in the shade, Cut in the Night, Electric Wheels, Before the Edge, Party Hearty). The fans were great every night asking about new plans for the band and asking about old members (Les, Woody, Ian, Pat, Derek, Alan) and we answered the questions as best as we could. 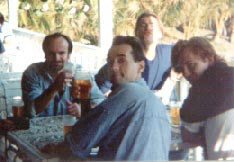 In early 1989 the US tour ended and everyone went home to relax. By June of 1989 I was preparing to leave for the next leg of the tour which included dates in England, Scotland, and Wales. I Arrived in England to be greeted by Eric and Kass. They put me up in a Flat on the Beautiful south coast of England in a town called Bexhill on Sea. Where Eric and Kass still live today. I unfortunately have not spoken to them for quite some time. 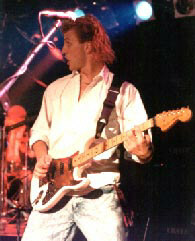 This is when I was introduced to Simon Stewart (guitar) and Mark Roberts (drums). We toured and played outdoor festivals, fairs, etc.. But there was one gig that we did at a place called Meadowbank Stadium in The Rollers home town of Edinburgh, Scotland. The house was packed and the fans were crazy as hell. They were rushing the stage and turning the place up-side-down. Finally the police came to put a stop to the anarchy but the fans kept going crazy. They came up on stage and tried to get Eric to quit playing, but we kept on. The police finally had Eric arrested while thousands of fans protested. They shut the power down and we were forced off the stage by this 300 pound woman police officer. I was fearing for my life while she pinned me up against the wall with her breasts and told me that I better back down or I would also be arrested. We continued over the next few weeks playing dates all over Scotland and England. Then it was time to return to the United States and Canada for another tour. We spent weeks touring all over the U.S.A. and then it was time for another tour break. 3 weeks off before the next Gigs in England and then a full blown, 2 month tour of Australia. Andy Boakes returned with me to my home town of Forest Lake, Minnesota, while the rest of the crew (Simon, Mark, Eric, Kass) went back to England to rest up for the up coming tour. I showed Andy around Minnesota and introduced him to all my friends. He had a blast! I took him water skiing up at our Lake home and he loved it. All of the women fell in love with his British accent. 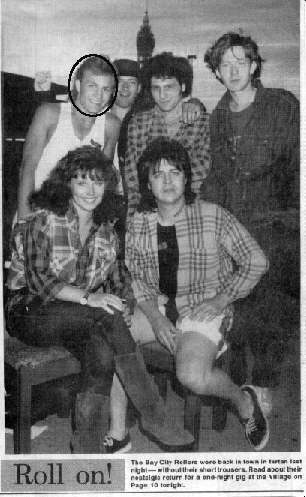 After 3 weeks (October 89') we both returned to England for rehearsal This is when I met Woody. He had just returned from South Africa and Eric talked him into joining the band. This is also when Simon Stewart left the band. We then left England for Australia. A 2 month tour of all the major cities Sydney, Melbourne, Canberra, Brisbane, and the Gold Coast. We played multiple dates in all of the cities to wonderful small theater size crowds (2000 people) and we were selling out alot of dates. I have to say that it was a real pleasure playing with Woody in the band. He was a real entertainer and a hell of a nice guy. After the Australian tour is when I decided to leave the band to pursue my own project. Eric and I had a "falling out" with regards to the direction the band was going and the future plans. I wanted to concentrate on new material and making new albums and pursuing record label interests and Eric was interested in getting the "Original Members" together to do another tour. This was interesting that he wanted to do that because all that I heard about was the fights and the disagreements that he and Les had for so many years. I understand that there are some lawsuits between the two of them to this day. I still follow the news and so forth. I still get fan mail to this day and am still interested in finding out any info on the new band and so forth. Gerd: Jason, where wer you born ? Gerd: Where do you lived when you got that call to reherse with the Rollers ? Gerd: Did you know the rollers before ? Gerd: What was your favourite song ? Gerd: What was the hardest to play ? Gerd: Were you in the studio with the band ? Gerd: How was it like ? Gerd: Did any of the recordings are on the Fan-Club tapes (e.g. Bay City Take 2, Wasteland, ...) ? Jason: I don't recall the exact song names because at the time they were just being written and were untitled. Gerd: Do you have any demo recordings that were never released ? Jason: Yes, I have a couple of songs somewhere in my tape collection that we recorded that I believe were never released. Gerd: Did you ever met Les, Ian, Pat or Derek ? Gerd: Could you contact them ? Many people are asking about what happend to them. Jason: I can try to get in touch with them. I haven't spoken to them for a few years but I do have phone numbers and addresses. Gerd: Do you know what Andy is doing know ? Jason: Andy is living in england with his wife and three kids. I believe he is retired from the music biz. Gerd: So what was the goal for the band at that time ? Make music and enjoy performing, make money, record music, ... ? Jason: Playing gigs to make money for Eric amd Kass, for the rest of us to enjoy performing and make new music in the hopes of a new record deal and possibly some more number 1 hits. Gerd: You said that after the Australian tour you decided to leave the band to pursue your own project. Can you tell me more about this project ? Jason: This project was a band called Parrish. We released 2 albums and did some recording with Prince here in Minneapolis at his Pasley Park Studios. The albums were never on a major record label and we have since dis banded. I have been writing songs and recording them with Milo the keyboard player in Parrish. We have a demo due out soon. 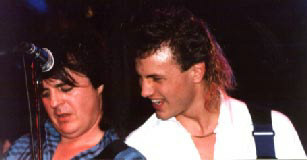 Gerd: Was Eric talking about getting Les McKeown back in the band ? Jason: At times I think Eric wanted all of the originals back together again. You know "The Old Days". Gerd: What do you think of Eric as the lead vocalist of the band ? Jason: I think Eric was an OK fill in on vocals but nothing compares to Les. I They also need to get over this fighting that has been going on for years. The court battles and such and they need to get a solid band. Always changing members does nothing for the consistency of the music. Many Thanks to Jason Medvec for the Story, the Interview, the Photos and the corrections to the Timeline !